Winners: Jordan Gross - Players' Player B Team (dedication and determination to the team's performance), Nikisha Grant - Coach's Player B Team (quiet but effective play in all games and positions),Harriet Limmer - Players' Player C Team (clear improvement in play but total support for others), Georgia Cooke - Coach's Player C Team (consistent play and encouragement for the team), Connie Gibbs - Under 12 Club Player (steady improvement at training and is willing to try all positions on the court), Caitlyn Safery - Under 17 Club Player (considerable improvement in her game play which has also improved her confidence on the court). Left to right - Harriet Limmer, Georgia Cook. 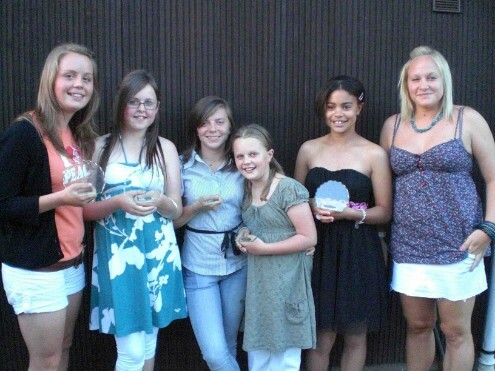 Jordan Gross, Connie Gibbs and Nikisha Grant - Lucy Cadge presented the trophies to the winners.